IPC stands for Industrial PC, a kind of device that brings computing power into all the numerous areas where it's needed, but where deploying a consumer-grade laptop or desktop simply don't do. Industrial PCs usually consist of a compact steel box with cooling fins to eliminate the need for a potentially troublesome fan, and with embedded industrial-grade systems circuitry inside.Though compact, most IPCs are fairly heavy and bulky. 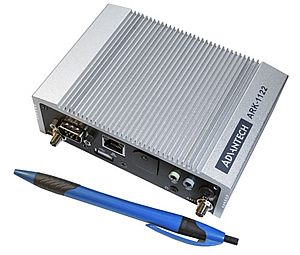 Not so Advantech's ARK-1122 embedded Box PC. Advantech calls the ARK-1122 "palm-size" and that's not just marketing hype. This little Box PC measures just 5.3 x 3.7 inches and it's about 1.7 inches tall. So if a Samsung Galaxy S4 smartphone fits into a palm, then the ARK-122 Box PC does, too, because it's actually not even as long as the Galaxy S4. That is tiny for an industrial-grade, industrial-strength PC. Yet, despite its comparatively tiny size, the ARK-1122 is a full-function PC. It runs Windows Embedded Standard 7 (or also Windows 7 Pro) on a 1.86GHz Intel Atom N2800 dual-core processor, providing performance that not so long ago was only available through Intel's high-end mobile processors. And despite the small size, the ARK-1122 has full-size, industry-standard ports and jacks, and not the fragile mini and micro versions of them. It doesn't use much power either. The Atom N2800 processor has a Thermal Design Power rating of just 6.5 watts(compared to 15 to 45 watts for mobile Intel Core processors), and only 3.5 watts for the also available 1.6GHz Atom N2600 processor. That means no fan, a small power supply, and economical operation.